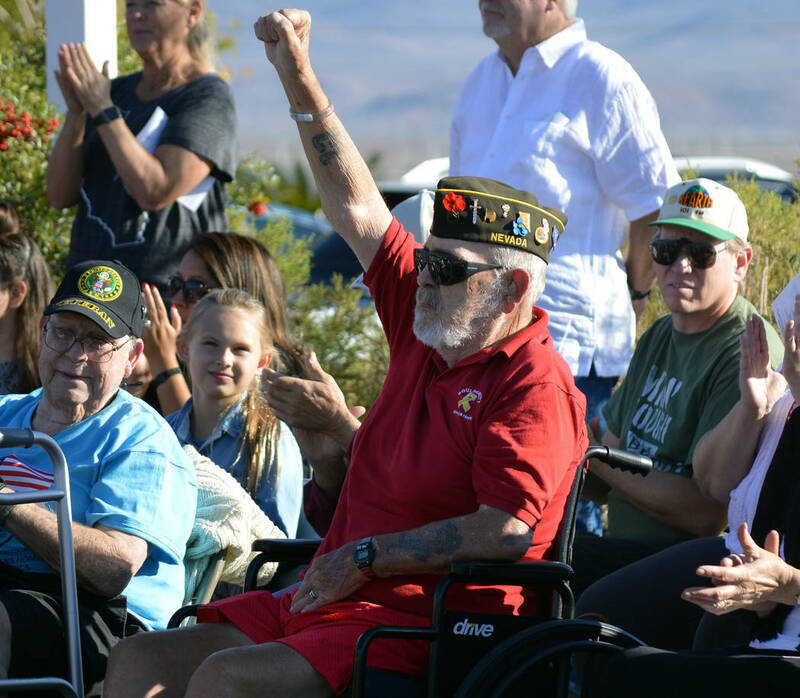 The annual Nevada Department of Veterans Services Veterans Day ceremony will be held Sunday, Nov. 11, in Boulder City. U.S. Army Sgt. 1st Class James Duffin is recognized at the 2017 Veterans Day ceremony last year. The 2018 ceremony is at 1:30 p.m. Sunday, Nov. 11, at the Nevada State Veterans Home, 100 Veterans Memorial Drive, and will include a celebration of the 100th anniversary of the end of World War I. This year’s program will mark the 100th anniversary of the end of World War I and will feature a full day of activities at the Nevada State Veterans Home, 100 Veterans Memorial Drive. It is free and open to the public. The program begins at 9 a.m. with a book signing by Patrick K. O’Donnell, a combat historian and best-selling author. O’Donnell has written 11 books and worked on several films and documentaries covering combat history from the American Revolution to the battle of Fallujah in Iraq. The traditional Veterans Day ceremony starts at 1:30 p.m. This year’s program features music by the Henderson Symphony Orchestra and vocalists Laura Schaffer and Phil Esser. There will also be a flyover. The Nevada State Museum and the State Archives will have some World War I displays and exhibits there for visitors to see throughout the day. Additionally, private collectors will have some World War I memorabilia on display. There will also be a limited number of 100th anniversary World War I pins for those who attend the traditional ceremony. To save a seat for the program, go to http://bit.ly/2O0pa2p or contact Josh Loftis at loftisj@veterans.nv.gov or 775-825-9748.